NETWORK UPDATE: THE BACHELORETTE finale gained 0.1 in final numbers, but the AFTER THE ROSE post-show lost the same amount. RUNNING WILD also declined by 0.1, as did PENN & TELLER: FOOL US and CEDRIC’S BARBER BATTLE. 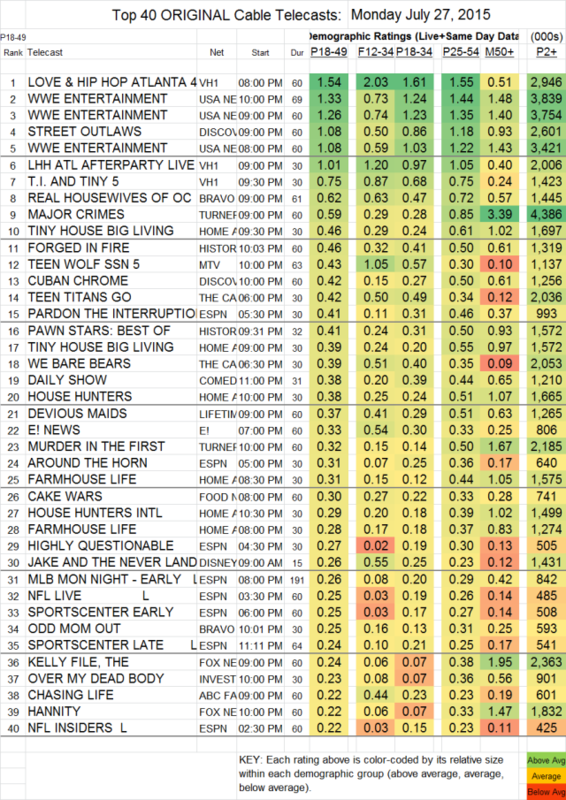 CABLE HIGHLIGHTS: VH1’s LOVE & HIP HOP ATLANTA was very steady in its place at the top of Monday cable, up 0.01 to 1.54. Its AFTERPARTY declined by 0.03 to 1.01, and TI & TINY held at 0.75. The other Monday mainstay, USA’s WWE coverage, was at 1.33-1.08 over its 3 hours, steady at its high point but down a tenth from last week at the low. On Discovery, STREET OUTLAWS fell 0.07 to 1.08, and CUBAN CHROME dropped 0.12 to 0.42. Bravo’s REAL HOUSEWIVES OF ORANGE COUNTY fell 0.04 to 0.62, and ODD MOM OUT lost a tick to 0.25. The top scripted show was TNT’s MAJOR CRIMES, down 0.06 to 0.59, with lead-out MURDER IN THE FIRST down 0.02 to 0.32. TINY HOUSE BIG LIVING (HGTV) was at 0.46/0.39 in its 2 half-hours. History’s FORGED IN FIRE fell a tenth to 0.46, airing after a PAWN STARS clip show at 0.41. On MTV, TEEN WOLF took something of a dive, down 0.16 to 0.43 (but steadier in the F12-34 demo, down 0.11 to 1.05). Lifetime’s DEVIOUS MAIDS was down 0.04 to 0.37, and UNREAL dropped 0.06 to 0.21. THE FOSTERS was preempted on ABCFamily last night for a movie, and without that lead-in, CHASING LIFE dropped 0.08 to 0.22 (and down 0.16 in the F12-34 demo to 0.44), while BECOMING US, while still out of the Top 100, gained 0.02 to 0.08. MAKING OF THE MOB (AMC) fell 0.08 to 0.21. BIG BROTHER AFTER DARK (POP) was at 0.07/156K.